When it comes to exercising it is almost like a conflict between your lazy-self and your fitness conscious-self. But when you bring home the Sole Fitness S77 fitness can be a ‘cakewalk’. With a high horsepower powerful motor, long deck, extra width, a high weight limit of up to 400lbs, quick control buttons for speed and incline and a large and clear display screen, this treadmill is ideal for one and all. Moreover, it has heart-rate monitoring with six standard, two heart and two custom programs. It even comes with lifetime warranty on the frame, thirty years on motor, five years on electronics and two years on labor! A noisy treadmill is the last thing you need in your bedroom. Thankfully, the Sole Fitness S77 does not make any excessive noise and is never a hindrance while watching TV or listening to music. The only downside, perhaps, is that it is not foldable. It requires a dedicated space inside the house and cannot be shifted around. Unless you have really serious space constraints, don’t let the non-folding feature hold you back from buying this treadmill because it is excellent in every other way. This Sole Fitness machine has built-in workout programs, which include six standard programs, two custom programs and two heart programs. The machine is equipped with a heart-rate zone and automatically adjusts the speed and incline to keep your workout intensity within the optimal zone. Additionally, the program stays on even after the unit is shut down. The Sole Fitness S77 has a high power 4.0 CHP motor, which makes transitions between speeds or inclines smoother and faster. Moreover, a heavy duty motor ensures longer durability, better efficiency and more strength, making this a long lasting investment. Unless a treadmill is easy to operate, none of its features make any difference. The S77 scores high on the effortlessness front. It has one touch push buttons for controlling speed and incline making it easier to change your variation while you jog or brisk-walk. Apart from these one touch buttons on the front panel there are buttons on the side handlebars to increase or decrease the speed and incline. Furthermore, there is an emergency stop button to bring your workout to a halt when absolutely necessary. However, assembling the treadmill is a two-man job. One needs assistance and enough time to assemble it. Thankfully, the instructions are precise and clear. 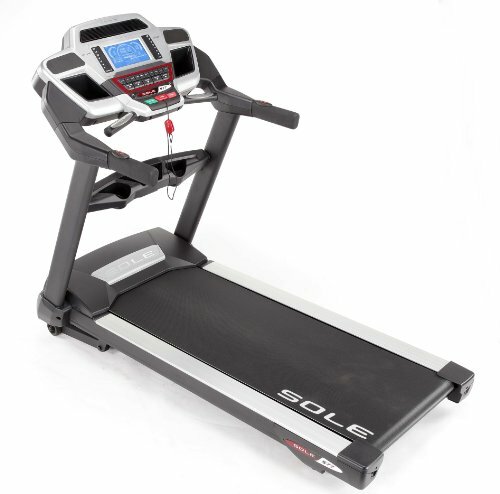 A big positive feature of the S77 model of Sole Fitness is its deck and running belt. Measuring 30 by 80 inches the deck has a running surface of 22 by 60 inches, which is wide enough for comfortable running and provides adequate leg space for any height. Further, the deck can sustain a weight of up to 400lbs, which allows heavy gait individuals to use it without any worries. Additionally, its cushioned whisper deck feature makes it comfortable and ideal for running, jogging or simply walking, reducing the impact on joints by up to 40%. Apart from all the features that the S77 is loaded with, it has a few noteworthy add-ons like two cooling fans for keeping you less stressed during workout, a music compatibility port or audio jack for connecting MP3s or iPods so that you can enjoy your favorite music while burning calories through the built-in speakers with great sound quality and an integrated message board to keep track of your past workouts and to guide you through the details of every workout. Music compatibility port for MP3s, iPods, etc. 4.0 CHP Motor, easy control buttons, extra-large deck, long warranty cover, great display, built-in speakers, music connectivity port, speed and incline control buttons on the handrails. Initial assembly is tough, may require two persons. Fan is little weak, doesn’t fold. In our opinion, the S77 is a decent investment, if not a cheap one. Even though assembly is not that simple, it can still be overlooked once you start using it. With a total of ten programs along with heart rate monitoring and a heart-rate zone, your workouts are completely controlled to be within your body’s permissible limits. Moreover, operating it is extremely easy – the display is simple and has a clear resolution tracking every detail of your workout and its biggest advantage is the wide running space.